Pancakes are one of the favorite breakfast foods in North America. No wonder there is a holiday dedicated to them. The National Pancake Day is celebrated throughout the United States each year on September 26. Pancakes are round, flat cakes prepared from a thick batter made of flour, milk, and eggs. They are cooked on a frying pan or griddle. American pancakes typically contain a raising agent therefore they are thicker than unleavened British pancakes. They are usually about 1/3 inch thick and 4 inches in diameter. Pancake batter can have other ingredients stirred in such as buttermilk, yogurt, strawberries, blueberries, apples, bananas, chocolate chips, sugar, cheese, and spices (vanilla, cinnamon, nutmeg). Thus pancakes can be sweet or savory. Pancakes are typically consumed at breakfast. They can be topped with maple syrup, butter, jam, honey, peanut butter, cane syrup, molasses, whipped cream, powdered sugar, fruit, nuts. 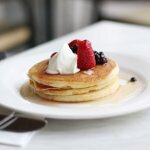 Unsweetened pancakes can be served with sides such as eggs, bacon, or sausage. To celebrate the National Pancake Day on September 26, cook your favorite kind of pancakes for breakfast. By the way, it is interesting to know that there is one more holiday dedicated to pancakes. Shrove Tuesday is generally referred to as Pancake Day because it is traditionally celebrated in many countries by eating pancakes.